No matter what size your house is, the process of creating functional, affordable storage solutions can be overwhelming. If you have a smaller home, the process is that much more daunting because you may not have the closets, basement space, etc. that you want. Here are a few tips to get you started before you get into the specific components of this process. Don't get overwhelmed. Instead of thinking about the process of organizing your entire house at once, break the process down into steps. Tackle one thing at a time. Now that you have your steps, make a plan for tackling one thing at a time. Figure out a time table that will work for you and your family. Remember that you are not alone. Many people go through this process at some point in their lives and will have to revisit it periodically to keep things working. Talk to family and friends who are also going through this for support and ideas. 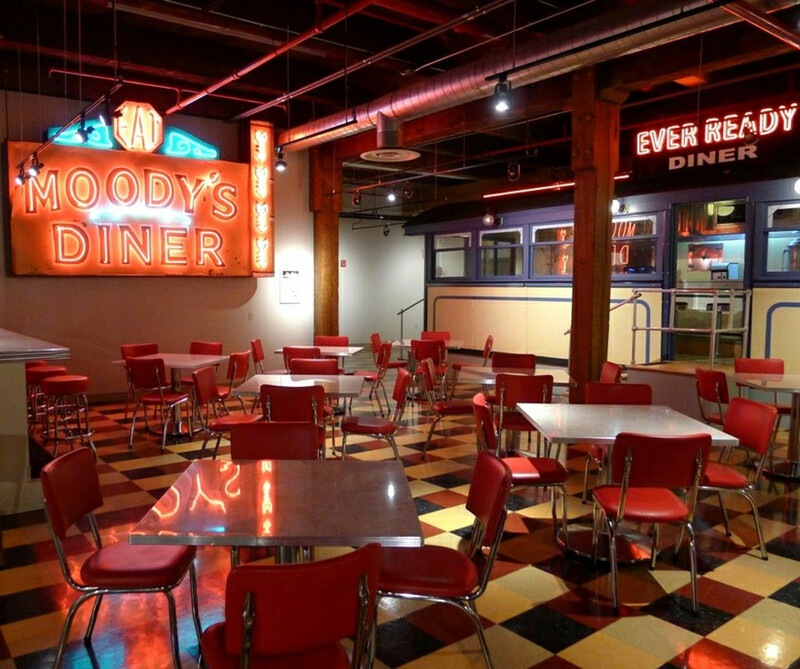 They may be able to give you new tips and storage solutions. Paper sacks. While these may not be a long term storage solution, they can be a great short term solution for food items and other items that you will use up. What you can't re-use you can recycle. Regular grocery bags. If you freeze a lot of food items, bundling them into grocery bags by category can be a great way to organize them for easy retrieval later. Popcorn tins. If you purchase Boy Scout Popcorn or popcorn gifts in large containers, save them for future storage. Plastic buckets. For example, growing up my family used to save kitty litter buckets. Wicker baskets. Look for new and/or vintage baskets that fit with your home décor. Old luggage/travel trunks. Decorative luggage and trunks can serve a dual purpose by storing out of season items while providing an aesthetic. 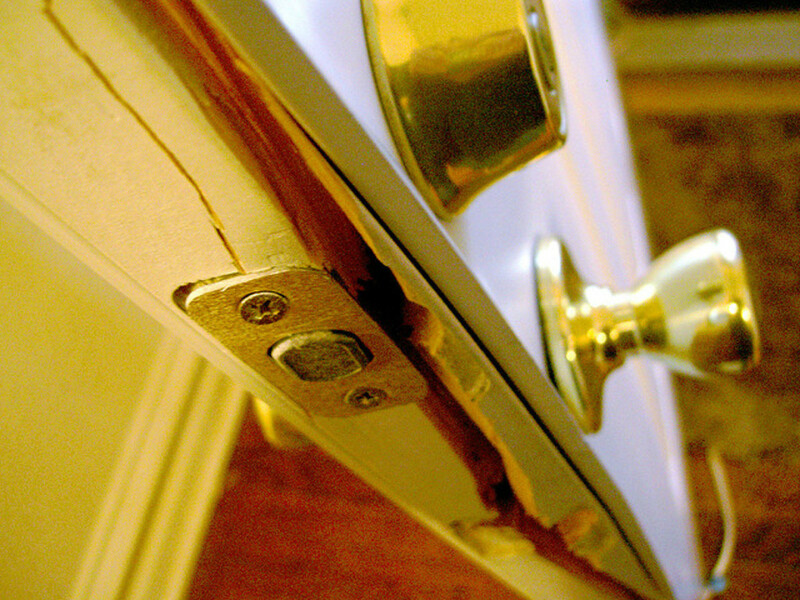 Most likely for your home storage, you will not be able to use items that you have on hand exclusively. However, there are a number of affordable options out there, too. Wire shelves. One popular option for kitchen, basement, and garage storage is industrial metal shelving. Consider adding casters to make your shelves mobile. Metal rod and S-hooks. For example, make a functional, decorative pot rack from pipe hung from the ceiling or install piping under kitchen cabinets or in closets to store smaller items. Baskets. Baskets come in many different sizes, shapes, and materials. If you don't acquire any on your own (i.e. as gifts) or find any on the cheap during thrifting tips, check dollar stores and watch for post-holiday sales at craft stores and big box stores. Peg boards. There are numerous options for peg board storage including kitchen pans and craft tools and supplies. Clear plastic bins. The lids keep out the dirt and moisture while the clear sides let you view what's inside without having to open them up. These bins are perfect in out of the way basement, attic, and garage spots where they can be stacked. Fabric. 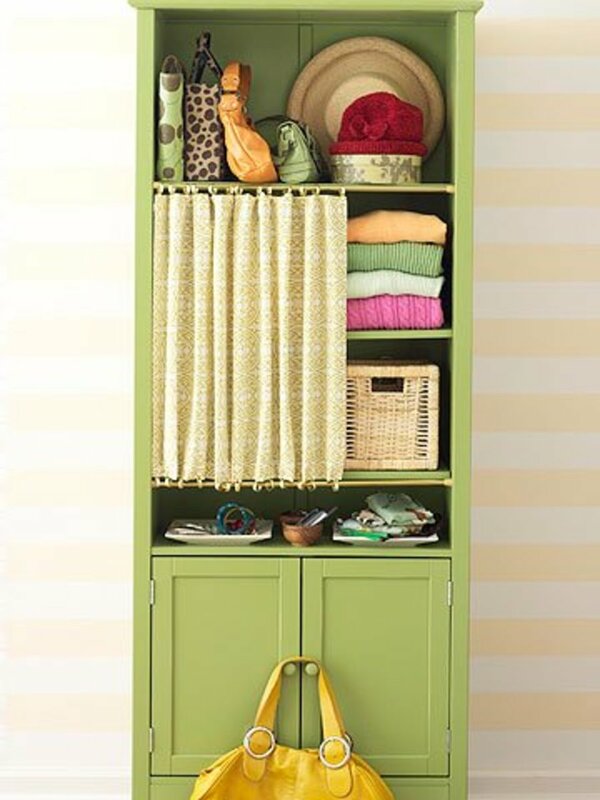 You can use fabric to hid shelves and other areas that are less organized or simply don't have doors. I've included a photo and link below for just one fabric option. Lots of curtain hanging methods work well for this. Storage ottomans. My husband and I got a beautiful one from a Christmas sale. Many of them are attractive and provide easy access living room or family room items such as blankets, toys, and games. Lazy Susan. 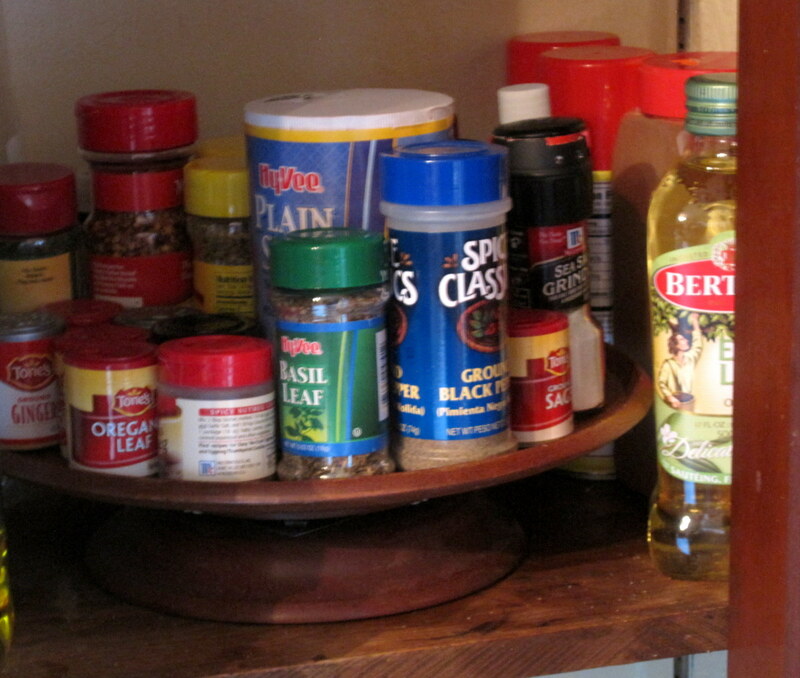 A Lazy Susan will greatly expand the storage space for corner kitchen cabinets. Consider using them for small pots and pans, pot/pan lids, spices, and small food items. Hanging shoe organizers. Consider using shoe hangers on the back or front of any closet door. In addition to shoes, they are perfect for storing outerwear (mittens, hats, etc. ), men's ties, craft items, and small office supplies (i.e. tape, extra staples). There are any number of places where you can purchase inexpensive storage organizers, but these are some of the most popular options. Dollar stores. 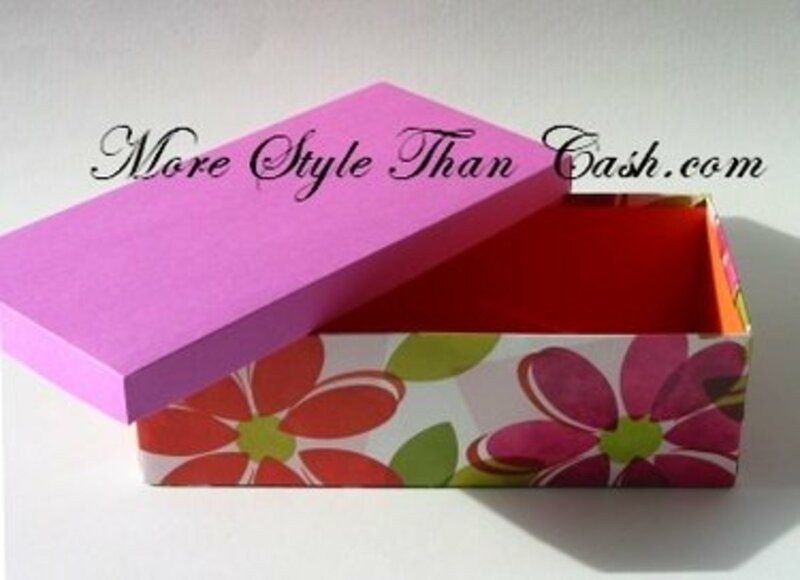 Many dollar stores carry a wide variety of storage containers made from different materials (i.e. plastic, glass) in a different sizes, shapes, and colors. Many stores have a dedicated storage container section. It's worth checking the kitchen section, too. Thrift stores. Thrift stores can be hit or miss, but it's worth checking them, especially if you go regularly. Just add this to your regular hunt list. Online coupons. Check web sites that sell kitchen appliances and other housewares, including Amazon. Coupon specific sites to check include RetailMeNot and DealTaker. Back to school sales at big box stores. Stores like Target often have back to school sections designed for college students. Look for deals on storage organizers there. 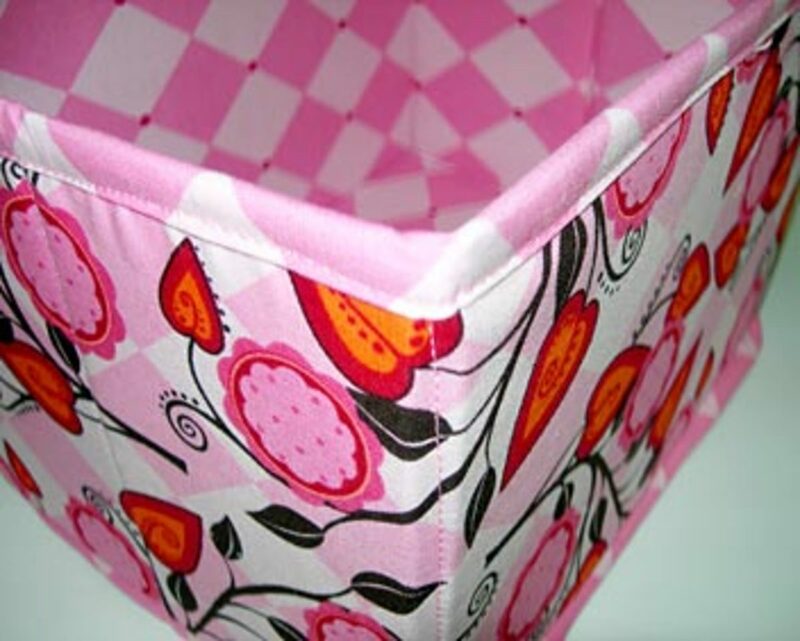 Fabric storage boxes: For those of you who like fabric storage bins and boxes and are crafty, consider making your own. You can save a lot of money and will have bins that will last a long time. Additionally, making your own allows you to make the sizes that you need with the fabrics that you like instead of having to search high and low for options that will work in your home. Other storage boxes (i.e. 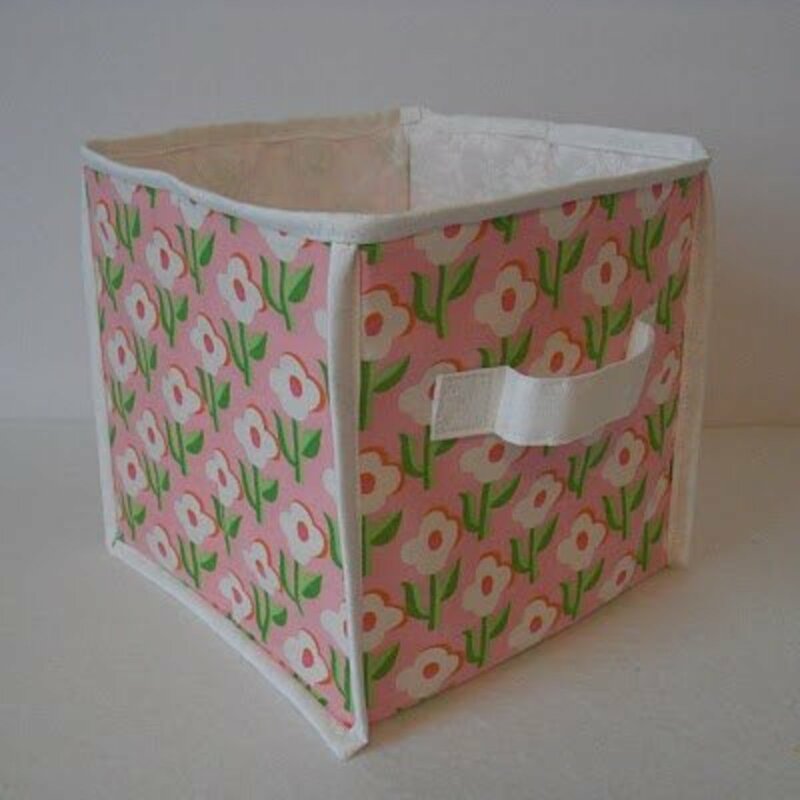 paper): If you are not interesting in sewing storage boxes, there are a number of non-sewing options out there, such as paper boxes using old Priority Mail boxes (first photo) or empty tissue boxes (second photo). 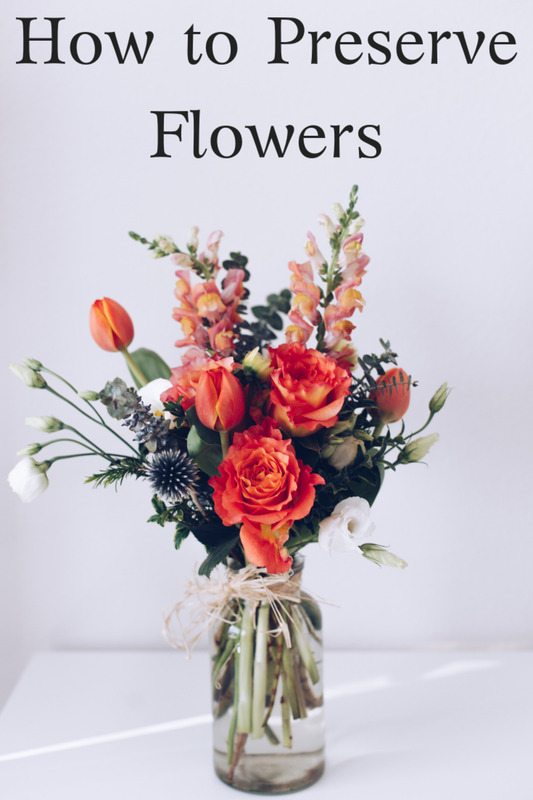 These are a great option for craft rooms and office areas but can be used anywhere, such as in the front entryway for mail or in the kitchen for recipe storage. You can decorate them with supplies that you have on hand or leave them plain. Customize an existing piece of furniture into an efficient storage system: Whether or not you already have a shelf on hand that you're thinking about using for storage, hopefully this post will get you thinking about new options for shelf storage. 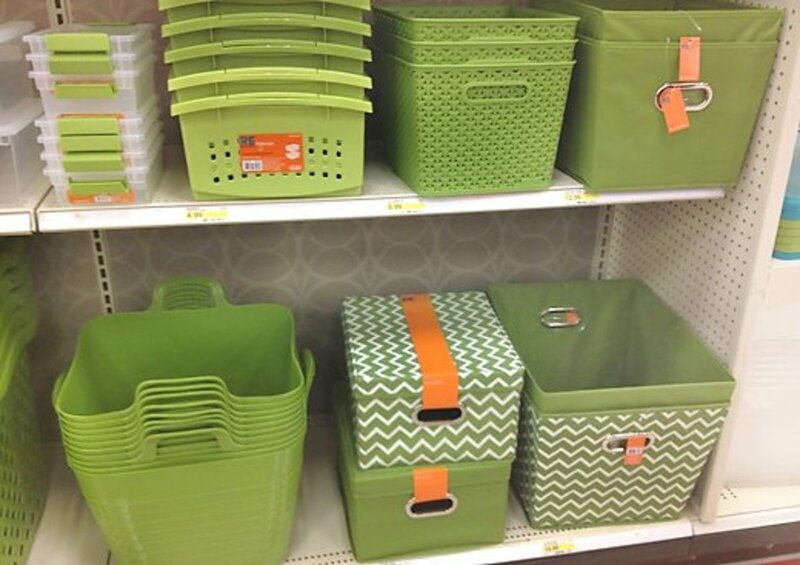 Consider adding baskets as this person did or using other methods for dividing up the items for easy access. A few simple decorations such as picture frames will make the shelf a part of the room instead of simply a storage unit. Curtains: This is just one method for hanging curtains to cover all or part of a shelf that does not have a door. The cafe curtains are clipped on each end and then put on tension rods. Many typical curtain hanging techniques will work for shelves. Scroll through the other ideas on the post linked below for more storage solutions for small bedrooms. 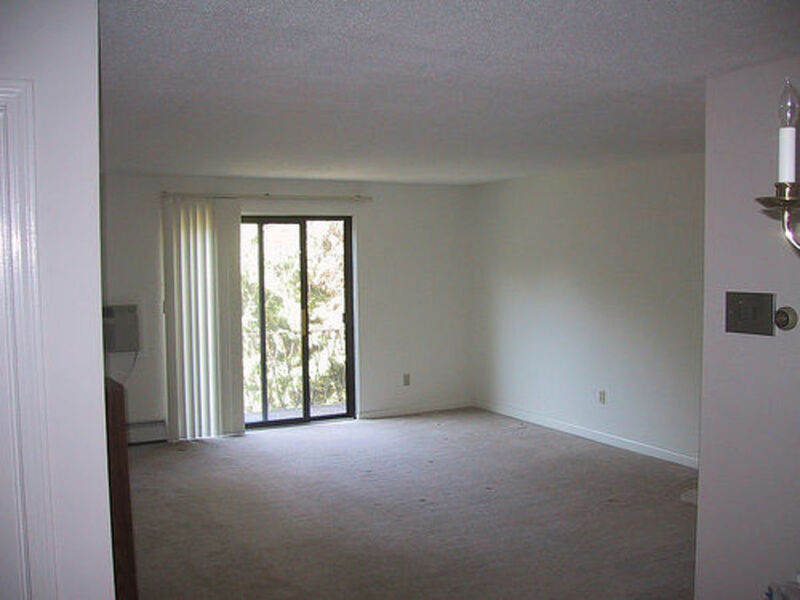 Capitalize on areas of space that are not currently being used, especially if it is because they are inconvenient (i.e. difficult to reach). These spots are great for items that you will not use all year round, such as seasonal clothing and Christmas decorations. Under beds. If you are short on closet space, consider using under bed storage for out of season bedding and clothing as well as extra pillows. For other items, use labeled boxes and storage bins to organize and reduce clutter. Look for rolling bins designed for under bed storage. Corners/back of cabinets and closets. Store seasonal and infrequently used items in these hard to reach places. Linen closets. Maximize extra space in the closets that you do have. Laundry room. It's very rare that you'll have guests in this space so it can be a good storage area if there's extra room. On top of cupboards. Instead of filling the tops of your cupboards with decorative items, think about ways that you can use this space functionally without creating too much clutter. Under staircases. Consider installing custom sized drawers and cabinets to store any number of items. Garage/rafters. Make sure that these storage areas are secured from animals and moisture. The rafters should be reserved for infrequently used items. Soffit space. This space under the stairs or ceilings can be opened in the front and finished on the inside to create new storage areas. 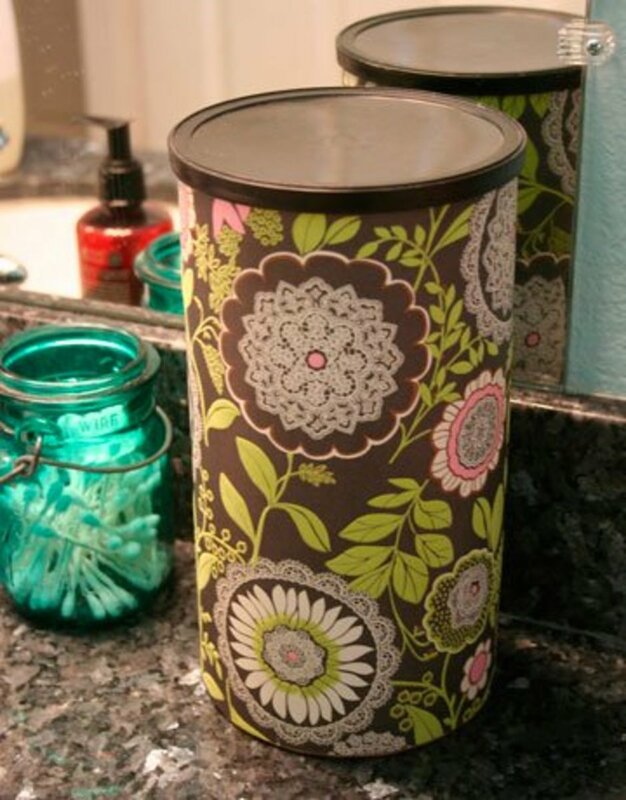 Stay organized with lists of empty containers and locations of stored items. 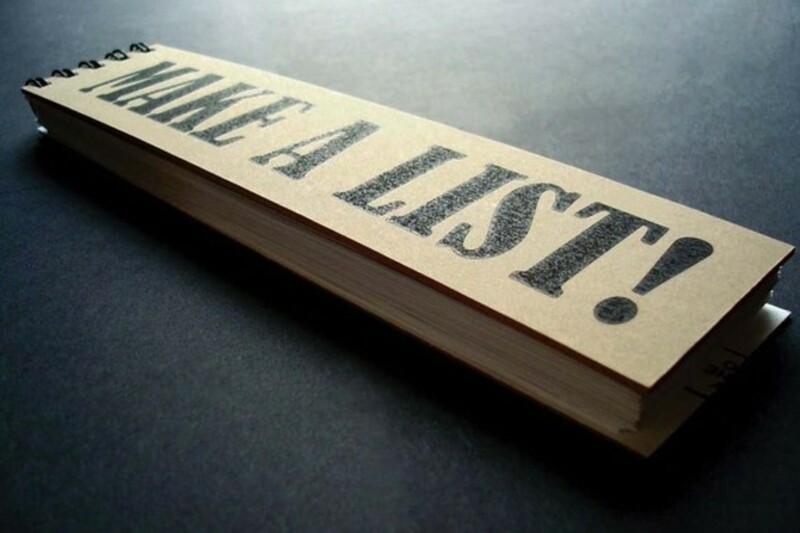 You don't have to keep super detailed lists. For example, with empty containers, make a general list of items that you can add to or subtract from as your inventory changes. One item might be "spice jars" with the number available next to it. For example, with stored items, if all of your Christmas ornaments and other tree decorations and supplies (i.e. tree stand) are underneath your basement stairs, simply putting "Christmas tree ornaments, decorations, and supplies" in your "under the basement stairs" list is fine. You don't need to list all of the individual items. More tips from the author for organization in a small home. space is precious in our apartment, so I'm always looking for new storage ideas. Thanks! I get my clear plastic bins from the Dollar store, but I'm into hoarding/organizing stuff with mason jars. Great article! It's so great to hear that, Casey! Thanks! Great, easy, affordable storage ideas that look great! Thanks for the tips! Great Hub! Saved it on favorites for my new house. Starting Fresh and new with Awesome ideas!! Thanks!! Thanks, Journey! I'm glad that you found so many ideas here that you like. Hi randomcreative, you offer great ideas here including: don't get overwhelmed, tackle one thing at a time, use the pegboards over the stove, use the curtains, and more. There are several highlights in the article that I like. Voted useful. Yes, mason jars are very trendy right now! There are so many possibilities for them. Glad to hear it, phtech! I'm glad that you're using that idea now! Pegboards and hooks are perfect for walls in small spaces. I love this! I always tell people to "look up" because that was the first mistake I made when trying to work with a small space. I didn't utilize the walls. I love the pegboard/s hook idea and will definitely be using it. Thanks! I hope that this is helpful for you, lifeintheworld! I hope that this helps, Diana! There are very good ideas here. I never have anything organized like I would like it to be. Voted up. Thanks, Hezekiah! I hope that this article helps. Thanks for this, there are so many things that I need to get rid off but difficult to throw away were I live. Nice to have a good storage system. Silvia, I'm glad that some of the online selling sites have worked out so well for you! It's great to hear that, LensMan! Thanks! The storage solutions mentioned in the hub are greatly useful. They are capable enough to keep a house clean and beautiful. Thanks for sharing such a wonderful hub!!! So many great ideas in here. You've definitely got me thinking of some new possibilities for organizing my things. Thanks for sharing, Rose! Thanks, Kimberly! I'm glad that you have these new resources. Great suggestions! I never thought about using things I already have around the house, like oatmeal containers. Very interesting! I'm always raiding thrift stores for pieces like this. Great post! lots of really good ideas. 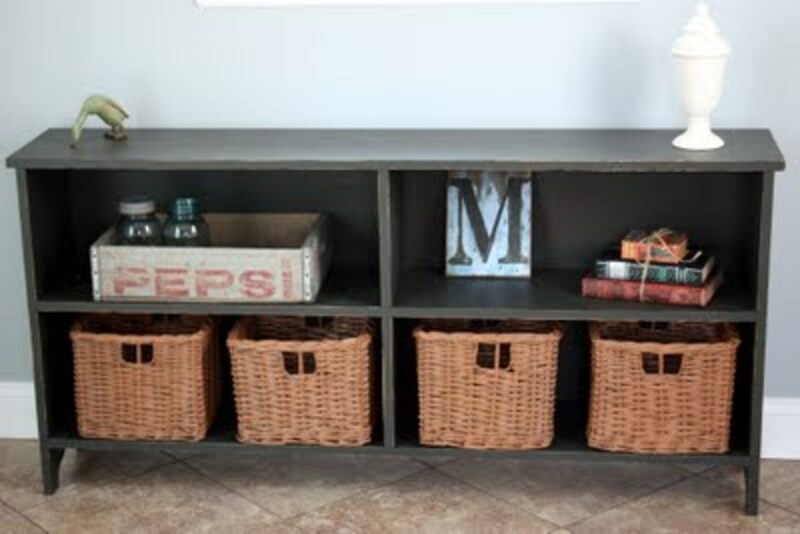 I love the recycled storage ideas. I am really getting into repurposing things I have around the house..Decoupaging coffee cans etc. Thanks for great hub.Voted UP and will share. That's great, Monica! Best of luck. These are some really great options! I need to get more organized and this hub has helped me to see a few ways that I can. Thanks! I'm glad that this is helpful for you, kygirl89! We just moved into our house and it seems that one room has become the "anything and everything room," full of boxes and books. Thank you for the affordable organization tips. Thanks, tirelesstraveler! Good luck with your reducing and organizing process. Thanks, masmasika and nmdonders! I'm glad that this is helpful for you. cherylvanhoorn, oh my! My mother-in-law is a hoarder, too, although it hasn't gotten quite that bad (yet). Hopefully yours will take to some of these ideas! Wonderful stuff. I have a mother in law who is a hoarder and the cupboards overflow. She is also addicted to containers but does not know how to use them. Will have to implement some of these ideas. These are great ideas. I know they'll be helpful. Nice hub. Loved the under the stairs photo. Great hub. In the process of reducing and organizing. Thanks! It certainly can be, though you don't have to make your storage projects crafty. This looks like a very crafty project. Nice hub. Thanks uNicQue! I'm so glad that this is helpful for you. It's amazing how many things you can store in glass jars. I'm a college student living in a really tiny house, in an even smaller room so this is very helpful. I love the popcorn tins and glass jars idea. I currently use small glass jars to hold my hair stuff. Thanks jagerfoods! Do you mean IKEA? They have certainly revolutionized the concept of affordable, not ugly storage for smaller homes. I'm glad that my explanations in this article were helpful for you! My wife first introduced me to Akia a couple years ago. I was amazed how they could put so muchstuff into so little of space. I found your post did more then display this but went on to explain it. Wonderfully written. I'd put it at 110 personally. Keeley and BritInTexas, thanks! I'm so glad that this is helpful for you. Fantastic, well written, and a much-needed incentive for me to start organizing what little space we have! Thank you for a very informative article! My house is small! These are great ideas! Great Article!! Thanks glorgeousmom! I'm so glad that you can benefit from this article. cloverleaf, that's great! It's good to get validation for many of the ideas here. Great hub. 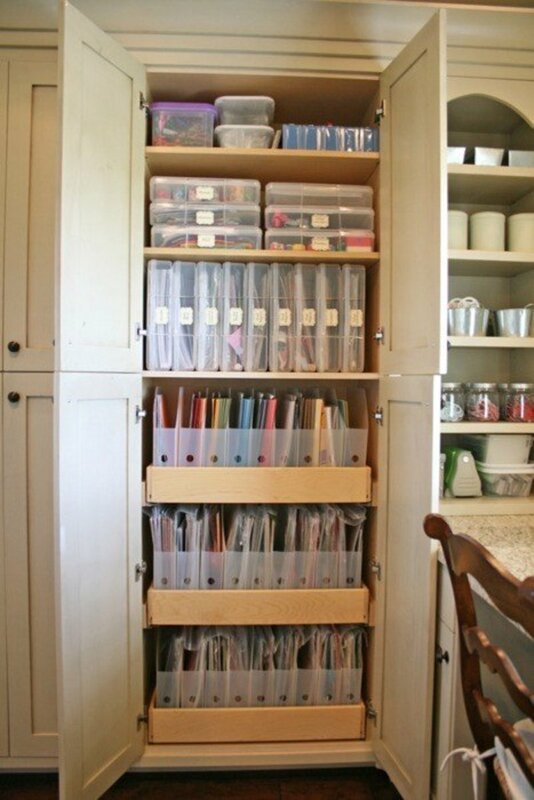 I LOVE to organize, and have used many of these ideas...including the oatmeal container. I use to live in a very small apartment, and found many ways to "stretch" the space. My husband tells me I could fit a 5 room house into a 2 room space...lol. Voted up and all. Thanks for a great read. Great hub and voted up. This hub is a treasure-chest of valuable storage ideas and I'm sure a lot of people(count me in) will benefit from this. Congratulations! Excellent hub and advice on how to organize small space. Thank you for sharing! Voted up! Thanks handymanbill! I'm glad that this is helpful for you. I appreciate the shares! Some really great Ideas. people are always asking how to get more storage. I bookmarked your page and will share thanks. jentaylorsc, thanks! Those rolling Rubbermaid storage bins are great for under the bed storage. I know a number of people who also use them for seasonal clothing. Good luck with your house reorganization! I am in the process of reorganizing my house. I love using rolling rubbermaid storage bins for under my bed. They are great as they can easily be pulled out from under the bed. A lot of my seasonal clothes go there. Thanks for the informative hub. It was helpful in coming up with new ways to organize. Wow. You have a lot of great ideas. naimishika, thanks! You're right that small places are definitely great storage options. p10, haha thanks! I'm glad. I just bookmarked this hub, there are some AWESOME ideas I can use to organize my scrapping supplies and a wall in my bedroom. Thank you randomcreative! This hub has inspired me to get back to organizing my home! Hopefully it will help with writing inspiration too! 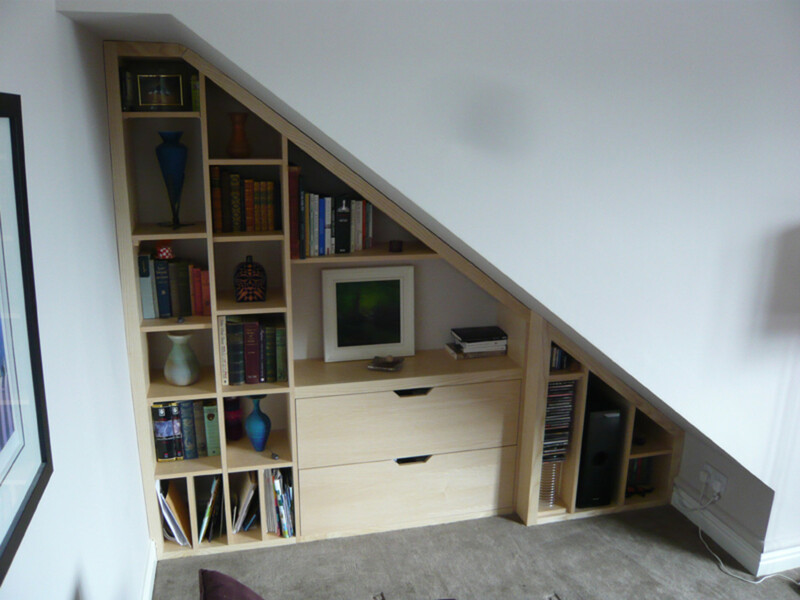 Ingenious space saving quirks. Love them all! Thank you for sharing . Great Hub. Thanks Lisa! I hate clutter, too. Best of luck getting organized! great ideas. My boyfriend is a packrat and we live together. I am going to try a few of these on his stuff. I hate clutter ;) Thanks for a great hub! Thanks chef-de-jour! Best of luck with your move. 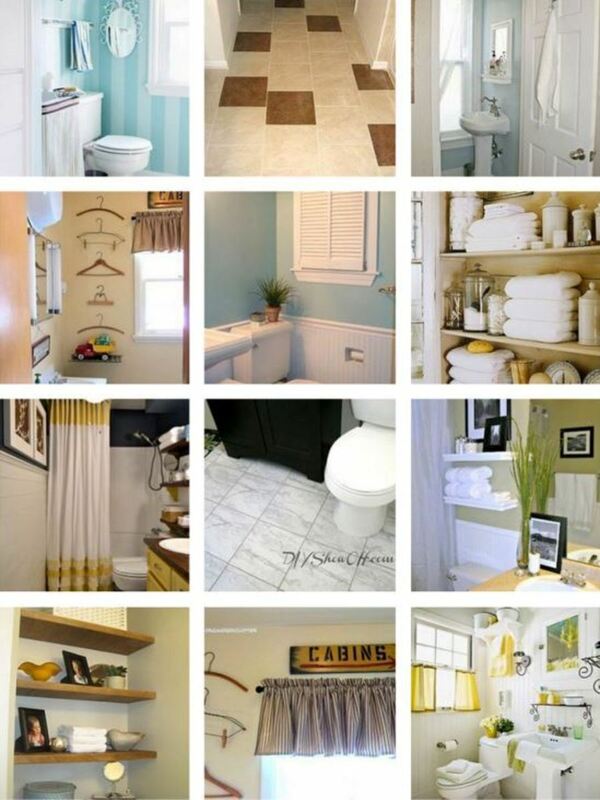 I hope that some of these ideas will be helpful in your new place. What a lovely hub but too organised for me I think.... but we're moving house in a few weeks and I've got to get myself chorganised or else! Ideas aplenty here..... surely I'll find one or two that will help ease the inevitable pain! Thanks Jeff! Yes, for sure. Thanks John! I'm glad. :) I am not a fan of clutter either. The Container Store is a great option. I bet that there are certain times of year, such as right before school starts, that they have good deals. Hi randomcreative, and you do justice to the philology of your name. This is a very 'random' and, 'creative' hub. I hate clutter; I'm allergic to clutter of any kind. I live close to Beverly Hills, so I go to "The Container Store" and purchase containers of different size. I don't buy book anymore, but the one I have I store them in these containers; I own 3 of these good size containers. Oatmeal containers are perfect for Legos! Good luck with your organization. I need to use some of these ideas for my boys' playroom! Goodness gracious - that room could use some organization. 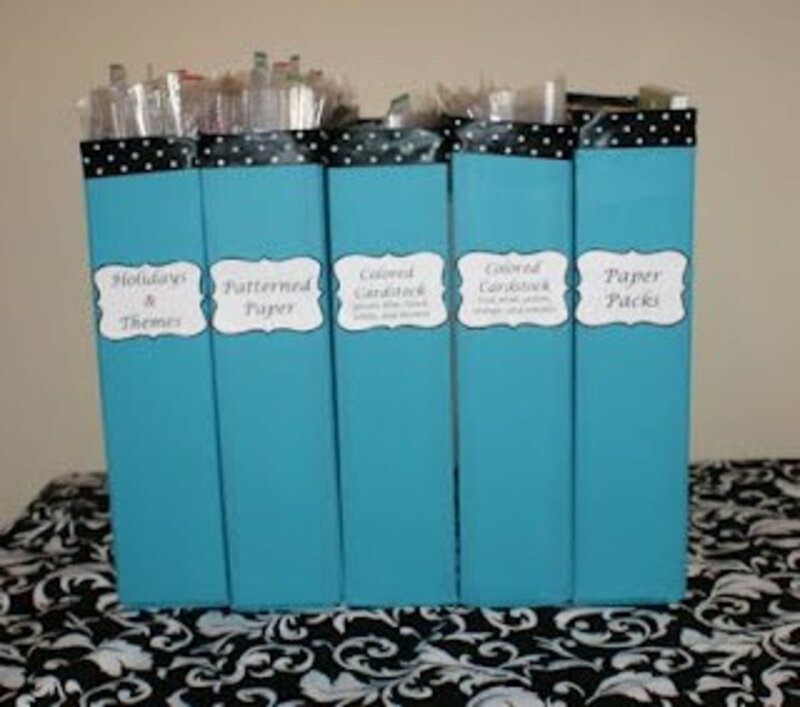 I love the use of scrapbook paper on oatmeal containers. I could store a lot of Legos in those! Those shoe organizers can be used for so many different items. I'm glad that this is helpful for you! We move every few years, so I'm always looking for new organization ideas. I use shoe organizers on the back of my doors both in the kitchen and bathroom, as Peruvian homes rarely have closets. I like the idea of using cafe curtains and covering canisters with decorative paper. Your photos are great and thanks for the useful ideas! Creative and economical! I give this hub a vote up! Thanks Susie! I'm so glad that some of these suggestions are helpful for you. Good luck with your storage! Loved your article, you have given me some great new tips that I can't wait to try. I live in a small house and I am always trying out new storage ideas, there never seems to be enough space. Fantastic And Wonderful ideas.Sharpen your brain more and get Great ideas And Keep on Sharing with us.brilliant post. buckleupdorothy, yep, those are called armoires here. A number of people have commented on how helpful these suggestions are for those living outside of the US. We really take our large living spaces and storage options for granted here. Amazing, and such a help re: how to approach such a large job. No one has closets - of any kind - in Turkey (they buy armoires, if that's what they're called in English - the piece of furniture that was a large white opera-singing lady in Beauty and the Beast), and efficient/aesthetically pleasing storage has become the absolute bane of my existence. These tips are just amazing! I can't wait to try the oatmeal one. This is super helpful. Thanks for sharing. Great ideas! 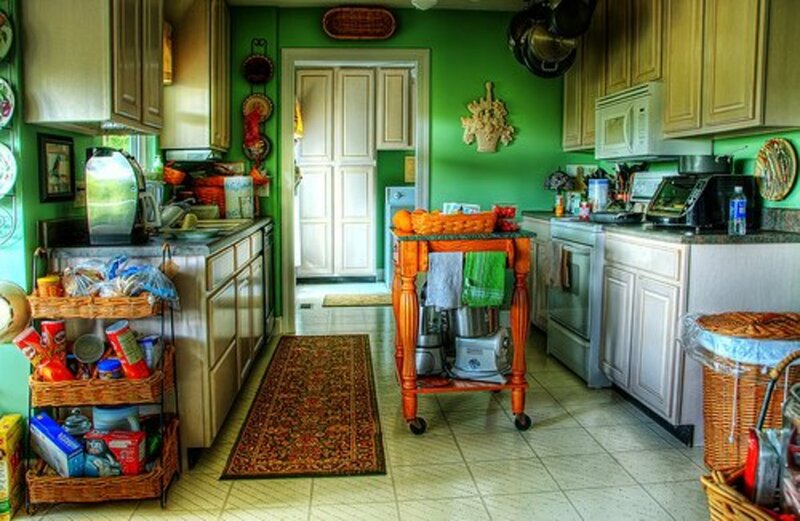 Thank you for sharing these tips, organizing an already messy house can be quite the task! Haha thanks Cassy! It's a lot of work to do that level of organization, but one it's set up, it makes everything so easy. Thanks Tonipet! Good luck with your home and the cupboard idea! Awesome ideas. Just perfect as I'm in the middle of renovating my small home. I'm going to think of a unique cupboard idea basing on these tips. Great photos too, liked the first one. Thank you Rose. I'm so glad that this is helpful for you, Tammy! Good luck with the storage in your new apartment. This is excellent! I can use these tips. I moved from a big house to a tiny apartment and storage is a big issue. Great photos and gorgeous solutions. I love this hub! You are definitely right. 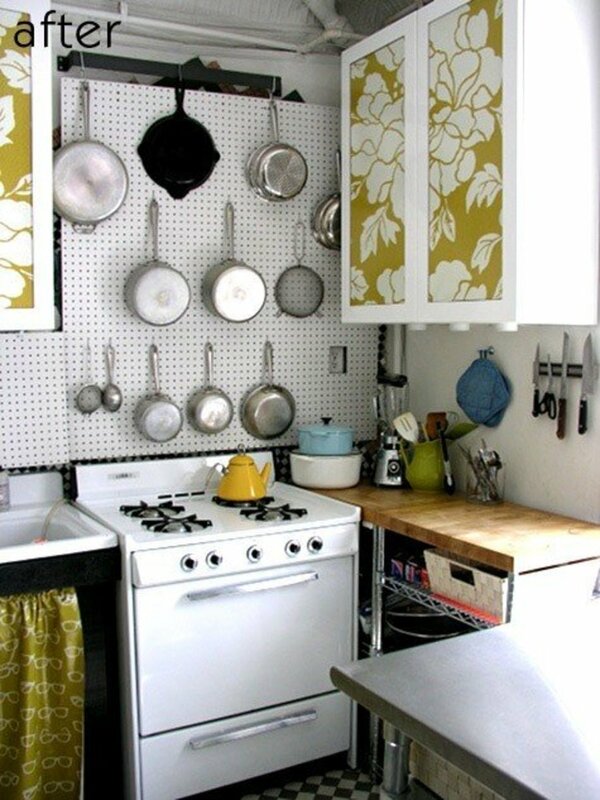 I wouldn't put the peg board above my stove either, but if that's what you have, use it! I'm glad that you enjoyed this. These ideas could also be implemented in large spaces to achieve a minimalistic visual appeal. Love the peg board in the kitchen. Not sure if 'above the stove' is the best place for it, but it sure is a nice idea. Lovely hub! Definitely sharing this one. Marcy, I usually throw them away, too. If you know that you need them, it's easy enough to start saving. Thanks!